Two All-Weather pitches are used on a daily basis by Gaelic Football, Soccer, Ladies Football, Athletics, Hockey and Rugby school teams. 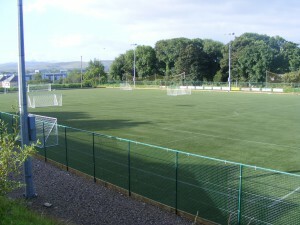 The flood-lit pitch can be rented to members of the public outside of school hours. It is also sometimes available during school hours to the local primary schools and other organisations in the area.